"Not bad for a Tuesday night, huh?" was Steve's comment to the cheering crowd as the opening refrain of his solo began, a track titled "On Time" written and released by his late Uncle Maurice. 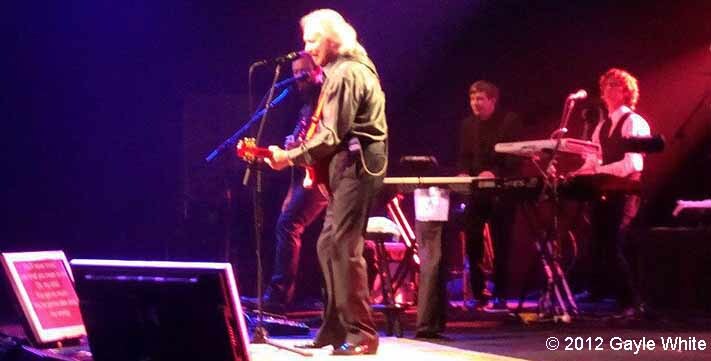 February 21st, 2012, at Seminole Hard Rock was Steve's Dad, Barry Gibb's first public solo performance, having previously only performed at private functions or as part of the Bee Gees. Steve played lead guitar at his Dad's side, backed by a 6 piece band and backing singers. In the pre-show newspaper interviews Barry had eluded to a couple of surprises, maybe he was hinting at the breadth of the set list, but more likely it was the solo and duet performance of Samantha Gibb Landin his neice, as well as Steve's cover. This, however, was not the only performance of the week. Barry and his band [including Steve] also entertained the guests at the 38th Annual Love and Hope Ball the previous Saturday [18th February 2012]. This black tie gala raises funds and awareness for the Diabetes Research Institute Foundation, a charity which has long held links with the Gibb family. Both nights were packed with smiles and happiness, power and emotion, and unforgettable entertainment from highly talented musicians. Hopefully at some point in the future a DVD of the Hard Rock show will be available to download or buy, if and when it is, we will let you know! Here is what some of those there had to say. Amanda-Lynn - Steve's low gravely voice was great with this song. He really rocked it. His guitar licks were nothing short of awesome on this song as well as throughout the concert. In addition, Stephen did the low droning changing, "Oh Solo Dominique" on the song "Every Christian Lion Hearted Man." Never before performed live according to one article I read. So obscure, this is one song, I admit, I do not know the lyrics. 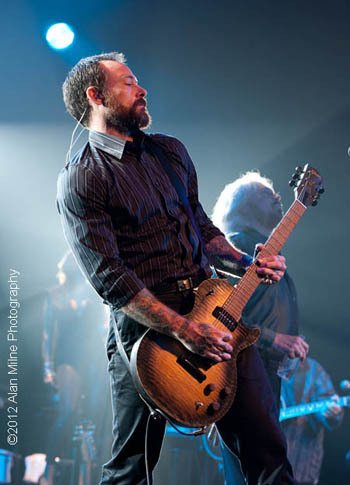 Being a fan of hard rock as well, Steve Gibb was the icing on this concert cake! A New Fan - His (Steve's) version of "On Time" was pure sexual rock and roll at its finest. He is no Daddy's little boy but a man in his own rite, forging ahead with the best that Rock has to offer while giving a well deserved nod back to those who came before. Rock on Steve, your voice is stellar, your guitar skills masterly. Dean - Awesome guitar skills. Carol & Leah - We went to see BARRY at the Hard Rock in Fla, but we left loving STEVE. Krissy - Blew me away! Great song pick! I'm dying to see a full up close version of this performance ... Barry as always was amazing .. (c'mon New York is calling) I bet he (Steve) still hasn't come down off CLOUD NINE!! Love Um! . Carlos - Such an amazing talented family! Came home from Hard Rock so alive but lost my voice. I really hope they release a dvd of the show for those who could not go. Craig - Damn, wish I could play like that! pbpulse - Palm Beach Post -- It was a family affair throughout the night as Barry's eldest son Stephen played guitar in the band as well as performed Maurice's track called "On Time" showcasing his impressive guitar skills and low gritty vocals quite the opposite of his father. The crowd at the Hard Rock was going wild, everyone on their feet for the opener "Jive Talking" and when Barry Gibb finished the song he drew a deep breath and smiled at the crowd. Broward Palm Beach [.com] -- Likewise, son Stephen's selection, a gritty yet otherwise unknown Maurice track called "On Time" gave him ample opportunity to spotlight his impressive guitar prowess and a gritty vocal that seemed well in sync with his tattooed hands and forearms. The boy does not look like a Bee Gee. Earlier, a representative of the latter, Maurice's daughter Samantha, made a well-received cameo appearance, beginning with a solo take on the evergreen classic "End of the World" (one of two non-Bee Gees entries in the set, the other being Barry's slinky cover of "Fever" which segued into an equally sultry version of "Stayin' Alive"). Starcasm.net -- Since their inception, the Bee Gees have always held up family as a core value, and despite the lack of Robin's participation, there was still plenty of Gibb to go around in Hollywood last night. Son Stephen Gibb - a hard rocker with his electric guitar slung low, arms tatted down to his knuckles, and with a little growl added to his vocal textures - laid waste to "On Time", a B-side rarity composed by his late uncle Maurice. In an evening formed around his father's timeless soft rock and pop ballads, Stephen Gibb brought the "Hard Rock" of the venue's name to life with edgy, blues-laced solos that bit down hard. The musical and visual contrasts between father and son were plain to see and hear, but all night long there were wonderful moments of shared love and appreciation - musically and emotionally - between the two. More photos of these fantastic events can be found in the Photo section of the main site.